Yesterday and today there where two tremor spikes in Katla volcano. This follows a higher then normal background noise that I cannot directly trace only to wind as I did first think. What is going on is not clear, but it remains a bit of events just before the July 1999 minor eruption (suspected). But it has been speculated by scientist that event was related to inflation event deep inside Katla volcano systems. But the actual fact remains unclear. More information on the event in July 1999 can be read here (in Icelandic). Pictures from the year 1999 of the harmonic tremor event in July that year. The harmonic tremor spikes in July 1999 in Katla volcano. Copyright of this picture belongs to Iceland Met Office. There was also special note on this tremor chart here from skh SIL station (now gone). But in the year 1999 this signal was most clear on Snæbýli SIL (snb). But today this signal appears to be most clear on Goðabunga SIL station and Eystri-Skógar SIL (esk) SIL station. I do not know what the difference is. But it clearly is something. Please note that all earthquakes have been cleared from this old SIL tremor plots. Current day activity in Katla volcano looks like this on the SIL stations where it is most clearly seen. Odd spikes can be seen here on this tremor plot. I do not know what they are. Copyright of this picture belongs to Iceland Met Office. Hard to see spikes can be seen on Goðabunga SIL station. They are the same as from Eystri-Skógar SIL station. Copyright of this picture belongs to Iceland Met Office. Same as above. But stronger then on Goðabunga SIL station. Copyright of this picture belongs to Iceland Met Office. It is hard to know for sure what this signals means. But I am sure that this signals are going to mean something someday. But when is hard to know. This entry was posted in Earthquakes, Harmonic tremors, Hydrothermal, Katla / Mýrdalsjökull, Magma, Monitoring, Volcano. Bookmark the permalink. Like Jon said, its extremely bad weather in south Iceland. Winds have been very strong, the strongest for many months now, since winter. So, any rise in tremor graphs will be due to this. About the Laki earthquake, its low quality and only one, so I don’t give it too much importance. 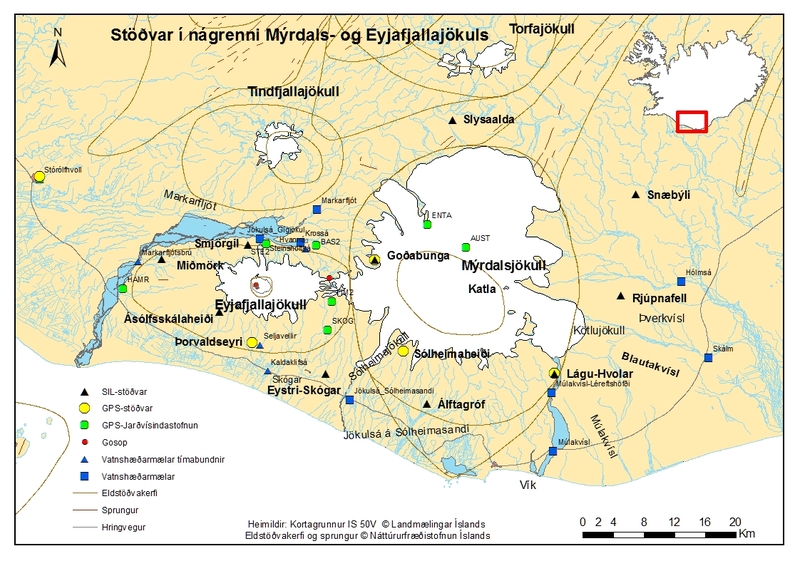 Eldgja fissure runs NE from Myrdalsjokull and opened 5050BC and 935AD; Laki 1783 and about 20Km to the SE of Eldgja. Was this Laki’s only eruption or is/was there older events? There was one in 4550 BC +/- 500 years. I can’t find a reference to an eruption at Laki in 4550 BC. Have you got a link? Everything else I have seen focuses on the 1783 eruption; one article even attributing the French Revolution to it! Thanks KZ, been watching Downton Abbey!! Yes, strong winds currently prevail. Low frequencies in the maximum! It’s really strange isn’t it? Only wind? Or a combination of factors? Please stop guessing, this is nothing but strong gusts of wind. Volcanic tremor looks way different. The red line i mostly due to deep ocean waves. The amplitude just highlights the fact how hellish the storm is on the sea! Is this hurricane Maria’s winds? Max set to 180 now. must be a hell of a strom according to helicorder. 25m/s (~55mph) sustained winds and 35m/s (~75mph) gust, yes that is a pretty strong storm. Nothing to get excited about, unless you’re outdoors in the storm… hold on to your hat! And if that data is correct it means it’s at the top of a glacial peak. No wonders the tremor readings there is a bit wonky, like the Grimsfjäll station. Weather will always be the most extreme up there, so data should be taken with a pinch of salt i think. When you see a trend on the other Myrdalsjökull SIL stations that corresponds with Goðabunga SIL station I would be more worried. As an addendum I would reccomend this site as a common site for all the measurments around Katla. http://hraun.vedur.is/ja/Katla/ No english translation there, but a lot of juicy data on one page. I’m not sure what’s the difference between two Goðabungu tremor charts are, but they’re giving different data. Here is a map of all the measure points around Eyäfjallajökull and Myrdalsjökull. It seems Goðabunga SIL station is not on the glacier, which makes sence I guess since you need a fixed anchor point for reliable data. Also worth mentioning is the significant uplift we’ve seen at the GPS station at Austmannsbunga since June. For more accurate data on Austmannsbunga GPS station you should visit the official site of the Institute of Earth Science at Iceland. Dunno, would Fimmvörðuháls be considered a “flank” eruption? Yeah it’s outside the caldera but I always thought of a flank event to be more on the volcano’s slope rather than on a ridgeline. Perhaps the waves are still battering hard on the cliffs. That could respond for such alterations, couldn’t it? I don’t believe it is waves battering the cliffs. The tremor of ocean waves (0.5-1 Hz) peaked around midnight and the sea along the shore should almost certainly also have decreased until now, still the short period tremor has rised more than 1000 units at station ASM. Before I have calculated a rise of 2200 units is about 10 times at GOD, 1000units should be about a triple jump. I think the signal is most clear near ASM, seems that the wind has not that much affect there. Clear signal also on September on 17th when it was not windy at all in the region and that signal also shows in ALF and ESK but not that much. Firts I was thinking about high run-off in nearby rivers but I don’t think that would explain the rise at NYL or other Reykjanes stations. Would glaciers grinding cause as much interference as ocean waves? The grinding of glaciers is… glacially slow. (had to do it) As such the noise that you would hear from it would be much lower in frequency and sporadic than ocean waves. This would likely show up as pops and cracks… and look a bit similar to small earthquakes. Others may have a better take on this, but you deserved an answer and no one had really chimed in. Please see the following two studies on ocean and microseismicity created by ocean waves. Hi, Jon. Did you receive the small research I sent on August 26th regarding the relationship between the tremor at station GOD and the significant wave height southwest and south of Iceland? The Eldgja fissure earthquake is a bit worrying. As we all know the Elgja/Laki/Veidivötn area is what we have nicknamed a “dead zone” seismically, or more to that point, “a highly ductile seismicaly inert zone”. Ie, it does not quake unless it is on the brink of ripping open. This quake was within the Elgja rift zone and a quake happening there at the same time as Katla is showing unrest might point to the risk of a regional rifting eruption. Problem is that the storm hid every trace of a harmonic tremor indicative of magma rushing into the fissure. If we had seen that tremor around the time of the quake I would have said it is time to be very worried. Now we did not, irrespective of it happening or not. But if we see more quakeing I would say it is time to take very large notice. Because this site only has quakes when magma pours in, or when the fissure rips open. So it should be either of, in this case most likely the first quake as magma poured in. I know that I am crying wolf a bit, but this is something we should look carefully for additional signs of activity. If we look sharply at the Vatnsfell plot there seems to have been a magmatic signature to the quake (Jón would know this far better then me), with that I mean that the spike has a wet look, ie. that it affects all of the frequencies. Yes, the quality is a bit low and will probably change, but it is in a rather hard to interpret zone to say the least since it dos not have a lot of quakes to compare with. We can only analyze the data we have. Hopefully this was nothing, time will tell. About the quake and the low rating. There are 2 reasons for this. 1. Distance to the SILs, and the lack of SILs in the area. 2. The quake happening within the fissure-fractioning areas. A fractioning area creates a zone of difraction for the waves propageting from the quake which makes it hard to pinpoint, especially when the quake is not that large. So depth and location is probably wrong. The size though should be seen as a “lowest” possible. The reason for this is threfold. 1. The quake happened inside a highly ductile zone, ie it works as a muffler in a sense as the waves are dampened by the higher ductility of the material. 2. The surrounding fractures faultlines work as mirrors sending at least parts of the energy away from its direct path of travell, thusly diminishing the apparant power. 3. The weather at the time caused a lot of background noise that dampens out parts of the readings of the energy hitting the SIL-stations. Based on this I would guess that the quake was between the apparant 1,9 and 2,5. 29,3 km would be seriously deep, remember my above stated things about the uncertainty, if it is the true depth it would be at the MOHO boundary and could as such be indicative of a separate feeding mechanism. But this is very hypothetical indeed. I would guess that the depth is actually 2 – 4 km and the reading of 29,3 is a point of deep reflection of a more powerfull shallow quake. Ahem, yes Iceland have many of them, but you only locate with the three closest… And those are not close. Vatnsfell is closest, probably colationed with Slysáalda (the most sensitive) and Kálfafell. But what is important is that there is no SIL-stations within the dead zone. Something I would guess will get changed if Katla continues to rumble. It’s only one quake in that area (Laki, Veidivotn, Eldgjá). I would not be worried, especially if it is a deep quake. I mean just because it is a highly ductile area, it doesn’t mean that earthquakes would not happen. Magma moving and causing an earthquake doesn’t have to mean that the fissure will rip open. Especially if it is a deep quake. And according to historical reports, before Laki eruption, there were several powerful earthquakes there, in the dead area. We have observed only one earthquake in that area. While Carl’s hypothesis is plausible, we can not yet rule it out, nor can we consider it probable. All we can do now, is to wait for the next Katla eruption to start. Only then can we see, what really happens (read: if Carl got it right). Carl, isn´t this quake a ghost-quake from the Landmannalaugar 2.0 quake? I would certainly check that out first before worrying too much about it. I do not think so, the time would have been slightly longer then. I know, the difference isn’t huge, it would then be 4 seconds difference, not the 1 second now. I though have my suspicion that it is not really Eldgja that quaked, if it was Veidivötn fissure zone it would only be natural with a secondary quake happening. Thanks all for lots or reading. This will keep me busy as have 16 days on my own here. My husband waved hello to all in Iceland as he flew past this afternoon on his way to California. I did notice the plane deviated from normal flight path I guess to avoid the bad weather. Carl interesting thoughts there. I have been watching those SIl stations for some time now as they seem to have been recording odd activity, I put most down to seasonal Glacial melt but didn’t convince myself !!! @ Jon thanks for those papers on ocean and microseismicity. Most is above my head but I have time now to study a little more! By the time my husband comes home he will be met with a mini Einstein :)…… or I will just spend more time digging my new vegetable garden. The latter if it stops raining! I also found this site which is good reading for introducing Iceland’s geology and Volcanoes. There are some other interesting sections worth looking at and relevant to this Blog. My thanks to Yves Mousallam.